Marian college student council (MCSC) has come up with an innovative idea for the Marinates, to open up their voice. 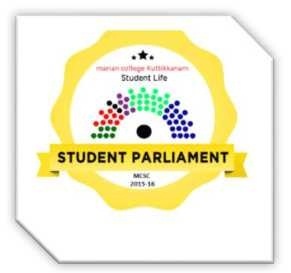 "STUDENT PARLIAMENT” is an open forum to share questions, suggestions and grievance to their respective authorities. It is scheduled to be conducted on 22’nd (Tuesday) September 2015 at 1.30 pm in College Conference hall. The MCSC cordially invites all the students’ opinion. Join and Grow with us. > Share your opinion, suggestions, grievance, complaints and questions to MCSC team on or before the 18’Th (Friday) September 2015. > It is compulsory that, 2 students from each class should participate in the open forum. > The students will get the answer for their respective queries at the time of open forum.